Women Crying at Work – Would You? 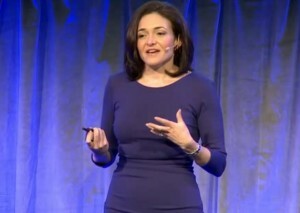 Sheryl Sandberg is the chief operating officer of Facebook. In such a high profile role (as a woman) her actions and comments get commented on widely. She’s a graduate of Harvard Business School and she recently gave a speech to their graduating students. In her speech she talked about tears at work. I want to put that in context so am quoting a significant extract of her speech below. Prior to this she had been talking about the importance of authenticity at work. “I’ve cried at work. I’ve told people I’ve cried at work. And it’s been reported in the press that ‘Sheryl Sandberg cried on Mark Zuckerberg’s shoulder’, which is not exactly what happened. I talk about my hopes and fears and ask people about theirs. I try to be myself – honest about my strengths and weaknesses – and I encourage others to do the same. It is all professional and it is all personal, all at the very same time. But the lack of progress over the past decade has convinced me we need to start talking about this. I graduated from HBS in 1995 and I thought it was completely clear that by the time someone from my year was invited to speak at this podium, we would have achieved equality in the workforce. But women at the top — C-level jobs — are stuck at 15-16 percent and have not moved in a decade. Not even close to 50% and no longer growing. We need to acknowledge openly that gender remains an issue at the highest levels of leadership. The promise of equality is not equality. We need to start talking about this. We need to start talking about how women underestimate their abilities compared to men and how for women, but not men, success and likeability are negatively correlated. That means that as a woman is more successful in your workplaces, she will be less liked. This means that women need a different form of management and mentorship, a different form of sponsorship and encouragement than men. There aren’t enough senior women out there to do it, so it falls upon the men who are graduating today just as much or more as the women, not just to talk about gender but to help these women succeed. When they hear a woman is really great at her job but not liked, take a deep breath and ask why. We need to start talking openly about the flexibility all of us need to have both a job and a life. A couple of weeks ago in an interview I said that I leave the office at 5:30 p.m. to have dinner with my children. I was shocked at the press coverage. One of my friends said I couldn’t get more headlines if I had murdered someone with an axe. This showed me this is an unresolved issue for all of us, men and women alike. Otherwise, everyone would not write so much about it. I’m not quite sure why that justifies headlines like ‘Sheryl Sanberg – ‘sob your way to the top’ although that may say much more about attitudes to women in top positions than any comment on what she has actually said. I was first alerted to Sheryl’s comments via other blogs and comments which were frankly horrified about how any woman could say it was OK to cry at work. The general consensus seems to be that it is not OK ever to show that type of emotion at work. Advice to women is not to show emotion or risk being labelled as an hysterical woman and conforming to type. If you believe, as I do, that it is important to be authentic and genuine at work as well as at at home (if you have to be a totally different persona at work I suspect you’ll not last long) then emotion has a part to play in that. And therein lies the rub. The world of business has been organised by and for men. We have thus been schooled to believe that crying, or tears, or showing emotion at work is wrong because it isn’t the male norm (and this affects men who show emotion as well). If we had a better gender mix at the top levels and we valued the attributes women contribute as well as what men bring, maybe the fact that a top executive admits to being moved to tears at work wouldn’t attract such comment, but rather the very sensible and inspirational parts of her speech would be quoted instead. What do you think? Have you cried at work? What do you think about people who are moved to tears at work? Would it make you think less of them? I absolutely agree with the importance of being authentic and that will at times mean being moved to tears. In my role, in a cancer charity, tears can be a welcome release in a all too sad environment at times, fortunately so is joy shared when good news arrives. Both the emotions that connect us to the value of our mission. But at time I have shown tears when I myself have been vulnerable and have feared that has weakened me. In truth the thing that weakens me most is when I am inauthentic. So don’t be afraid to cry if it’s real! Thanks Audrey. I can imagine that you must be faced with many emotional situations in your field. Brilliant story, Sarah! Thanks for sharing it. By the way, if you want to read some more about Sarah and how she ended up being an historical novelist, check out this link, we had an interview!